I wanted to write something about the topic of Autism, because when I looked back I have never seen this topic addressed by anyone in our Muslim community. Autism is a growing issue in the world as one in 68 children are diagnosed with this condition. I wanted to address a few issues about dealing with Autism in hopes that it may help someone who is a parent, loved one or a friend of someone with a child who has Autism. I’m not going to go into what Autism is exactly, because that would be a lengthy discussion and there are plenty of websites and books dealing with this topic. I will just say briefly that it is a neurological disorder that affects ones social and communication skills. It is termed as being on the spectrum, because there are so many different variations of Autism that every child is different and they all have different needs according to how many of the indicators the child has. When a young couple gets married they have hopes, plans and dreams for the future. They want to travel the world, find a place they can call home, raise a family, etc. Once they are blessed to have a child their world turns upside down in a good way. What I mean by that is they are so happy to now have a child that everything in life is now all about their little bundle of joy. They stop thinking about themselves and just plan and daydream on what their child will be when they grow up and all of the things they want to teach them. After a few years they start to notice that their child isn’t reaching the milestones that the other kids their age have met, but still remain optimistic saying he will catch up. As time goes by, they start to notice that maybe their child doesn’t respond to his name when being called, is reclusive, repeats actions over and over again like flapping their hands, spins in circles over and over again, lines all of his or her toys in a neat row side by side instead of playing with them the regular way a child would play with them, the child cant understand things when you are asking them to do something, doesn’t speak or tries to speak but has trouble getting the words out. These are all signs that a child with Autism may have. After the long wait to get an appointment with a Child Development Specialist they find out that their child, who is their only concern in this world, has a condition that doesn’t allow them to think and process information like the rest of the kids. He thinks differently and can’t be taught by the traditional way and style of parenting that most are familiar with. This can feel like you have been hit with a ton of bricks and is overwhelming to say the least! All of the things you wanted for your child to become seem so far out of reach now. You are having trouble just getting him to communicate with you and to understand you when you tell them that you love them. Do they know how you feel? Yet worst of all is that your child is going through so many difficulties and is unable to express himself through words and you are unable to do anything. You want to be there for him and help him but not sure what he needs and are just left feeling hopeless at what to do. For a parent who is going through this struggle they really need a strong support system and someone to turn to. First and foremost, they must rely on God and then seek support from family, friends and community members. They may and will encounter all sorts of responses when they present their struggle to people surrounding them. Some will say it’s the Vaccines that you gave your child. This in no way helps the parents, because it makes them feel as if they were the ones who gave their child this and can cause one to start blaming themselves and going into a dark world of depression. After all, if a parent got their child vaccinated they were only doing what they thought was best in trying to protect their child from harmful diseases. How would they ever know something like this might happen? Some people in the family might blame the other side and go back and forth about whose fault it is genetically. This causes nothing but harm and fighting amongst family members. Who cares where it came from?! What matters most now is how we can come together and help this child who desperately needs our attention, support and love. Some may come and say your child has been diagnosed with this due to some sins you committed and God is cleansing you from the sins by this. I mean how does the person saying this even know that this is the reason? It is only an assumption on their part and makes it seem as if it is the parents fault for this and is very unsympathetic towards someone who is facing this difficult situation. After all Autism is by no means a curse from God, rather it is just a learning and developmental disability. This doesn’t mean the child is un-teachable, rather he will simply not learn according to the conventional methods of education and instead he would need an individualized learning plan that works for him. People with Autism think differently than we do, but in some cases they are geniuses. Some famous people in history have been suspected to have or had Autism such as: Albert Einstein, Vincent Van Gogh, Mozart, The creator of the television show the Muppets, amongst others. One famous person that I can think of during this era who has Autism is the famous actor and was also the writer of the movie Ghostbusters: Dan Akroyd. Lastly, apart from all of the other types of reactions I mentioned above, you will have people who will comfort you and tell you that they are there for you and your family in any possible way they are able to help. They encourage you to be the best parents that you can be and they love your child even more than before. This is the type of response that a family needs when they are going through this whirlwind of emotions. It has been very hard for me to soak all of this in when I recently found out my son Ali, who is almost 3 years old, was diagnosed with Autism. As a man we are hardwired to fix problems when they arise. I just kept thinking that there has got to be a way for me to fix this. I have worked in DC and Virginia with adults who have Autism since 2008, but I only transported them from their homes to their day support programs or to their jobs. Even though I had interacted with them over the years I still was not fully aware of what Autism really was. So, I went to a bookstore nearby and bought tons of books on the subject in hopes to learn as much as I can. I am a researcher by habit and I was searching for the answer to this riddle. I found out that there is no cure for this condition, yet it can be improved through intense therapy sessions that are sometimes as much as 40 hours per week. I only want what’s best for my son and to be there for him as much as I can. I don’t know if he understands me all of the time, but I do believe that he knows I love him unconditionally. I often find myself driving in the car on my commute to work crying as I think about my son suffering through this and how frustrated he must be when he wants to tell us something, but can’t conjure up the words he needs. I watch him as he plays with other kids, but when they talk to him he just stares back at them, laughs and runs off to continue playing. One little 5 year old girl innocently asked me if he was okay and why was he acting weird. I assured her that he was okay, but deep down inside I couldn’t help but to wonder and be frightened at the thought of some other children bullying him when he attends school. I often, as any father would, think about all the dreams and aspirations I have for him and wonder if he will be able to overcome this obstacle and become whatever it is that will make him happy. I know and have faith that he can do it, maybe not by the traditional way of learning and doing things but through his own unique way he can overcome this. I will always be thankful, supportive and proud of him no matter what. 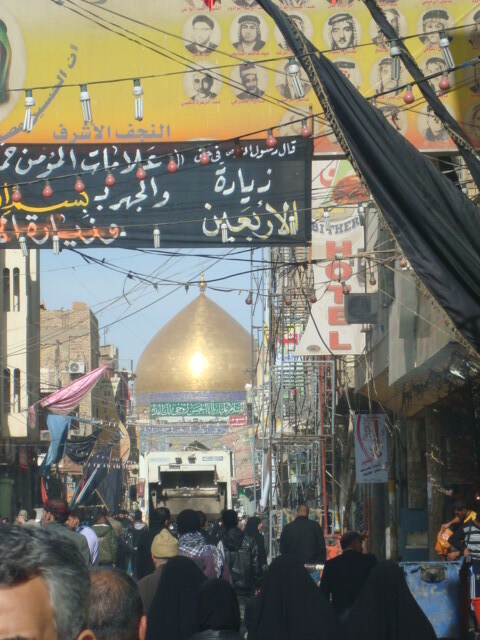 I can recall what an amazing feeling I had on my first day in the Holy city of Najaf, Iraq walking through the streets and seeing the bright golden dome of Imam Ali (pbuh). The city of Najaf is ancient and everything seems to be a dusty sand color, but the shrine of Amir Al-Mumineen is so bright and vivid that it brings life to the whole city. 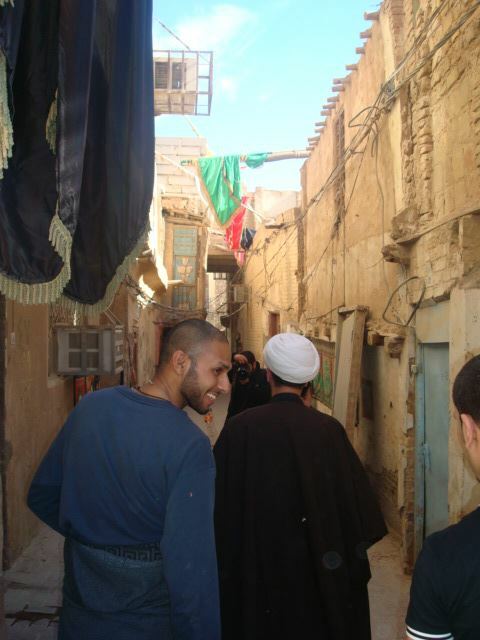 It seems to be the very center of existence for the lives of Najaf’s inhabitants. 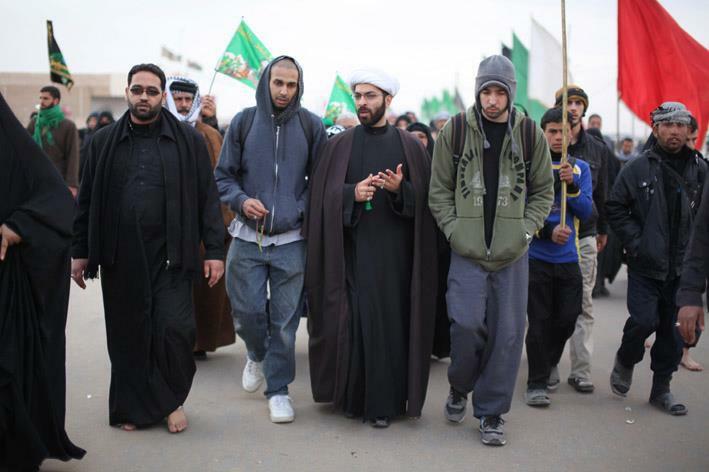 The second day I was there, we were walking with Sheikh Mustafa Akhound and a few friends when I noticed we were walking in a different way than usual. So, I asked where we were going as we were navigating through the back alleys of streets that were filled with low hanging electrical wires and air conditioning units protruding out of the walls. He said he wanted us to meet someone and that it was a surprise. Turns out it was his teacher and mentor Ayatollah Sayed Murtadha Shirazi. When we arrived at his door he welcomed us all into his home and had nice fruits and drinks for us. He allotted time out of his day to give us a small talk and to answer any questions we might have. It was such a great honor to meet someone with such a high rank in Islamic knowledge. He was very nice and was genuinely interested to know about where I came from and how I chose to become a Shia Muslim. I spoke to him as much as I could with my broken Arabic and also Sheikh Mustafa would help with translating for me. He gave us a small lecture and then afterwards Sheikh Mustafa asked us if we had any questions that we would like to ask Ayatollah Shirazi. I had come all of the way from the United States and found myself sitting in the house of an Ayatollah asking me if I had any questions. I decided to take this opportunity to ask for some very important advice that would help me throughout my journeys in life. I chose to ask him how could we get closer to our beloved Imam Mahdi (May Allah hasten his reappearance). He answered me with several things that I will list here. I have been thinking about my visit and it prompted me to write about it so that others can read this and benefit as well. The first thing he replied was that this is an easy thing to say, but in reality it is not an easy task to accomplish. He continued to say that we needed to pray to Allah and ask Him to open our container and expand our capacity, so that we can receive the knowledge pertaining to Imam Mahdi (pbuh). Being among those who are close to the Imam means having a very high level of knowledge and piety, so we must be prepared mentally and spiritually to understand, comprehend and accept this knowledge. He proceeded to say that one of the ways that we can gain proximity to the Imam is to fulfill all of our obligations (wajibat) that Allah has asked from us. Next is to stay away from all of the things Allah has forbidden us from doing (muharramat). This reminds me of the first thing he told me when he said that it sounded easy but in reality, was not an easy task at all. Last of all he told me that to become close to the Imam we should be careful of how we treat others. We should always treat others well, with respect and give them their due rights. We should never be oppressors and mistreat people. That was the advice I received from the respected scholar. I hope that all of us can apply these principles he taught that day and become servants of the Imam of our time. 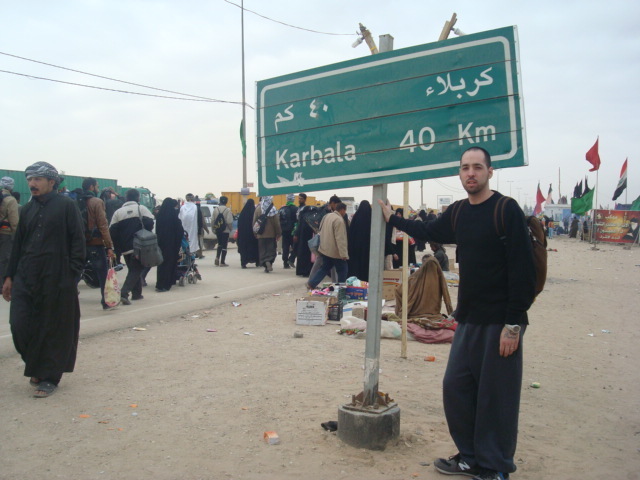 After that, I left that great city of Najaf and started my walk towards Karbala to pay my respects to Imam Hussain (pbuh) and the Martyrs (Shuhada). I saw how so many people were lined up with stands giving away all they had to the pilgrims. They were giving away food, tea and sweets. They had tents and blankets for sleeping and were even massaging the weak and fatigued pilgrims. 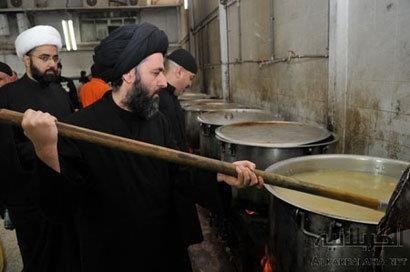 They were ready and willing to give away anything they had for the guests of Imam Hussain (pbuh). I started to think deeply about what I had to offer in the way of Ahl ul Bayt (The household of Prophet Muhammad), peace be upon them. For those who have not seen my documentary Journey of the Spirit on how I converted to Islam, I chose to become a Shia Muslim after studying both Christianity and Islam while serving my first year in a maximum-security prison. This was when I was 17 years old, in 1999. In total I served 9 years before my release. Throughout this time I did not work and I chose to dedicate my time to reforming myself and to learning the religion of Islam. I would read one book from cover to cover then start the next one repeating this cycle for 9 years, al-hamdu lillah. 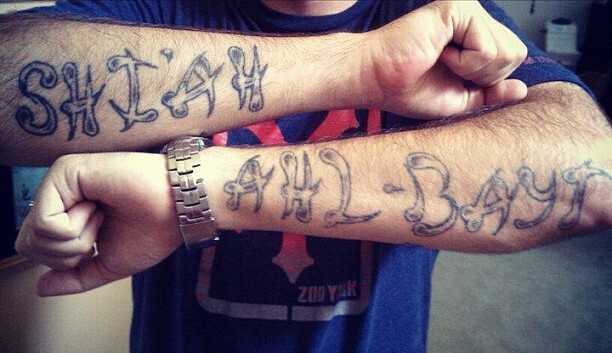 I also learned Arabic when I was 18 years old. Since my release from prison I have been active within the Washington, DC community. Getting back to the story at hand, I thought that the best way for me to help people and to serve the cause of Muhammad and his family (peace be upon them) was for me to use the knowledge I had gained while in prison to compile and write books on Shia Islam. I learned that the father of Ayatollah Sayed Murtadha Shirazi had authored around 1,400 books. His name was Ayatollah Sayed Muhammad Shirazi and he was one of the great Maraja of his time. I decided to take this path and to help spread what I had learned to my fellow English speaking people. 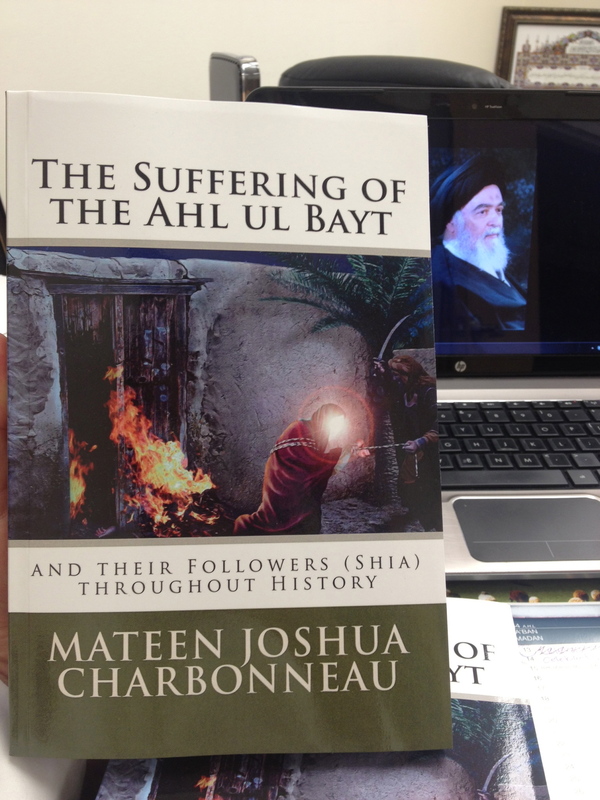 Since I have returned from the blessed city of Karbala I have published three books on Shia Islam; The Suffering of the Ahl ul Bayt and their Followers (shia) throughout History, Christians who Defended and Died for Prophet Muhammad and his Family, and The Mystery of the Shia. Also, on the same day that my son Ali was born (in March of 2013), I started attending Islamic Seminary (Howza) taught by Sheikh Mustafa Akhound at the Imam Ali Center of Springfield, Virginia. I plan to keep writing more books and inshallah (God-willing) one day translate some of the great Shia books from Arabic to English. It has been about a year and half since I was in Iraq, but Ayatollah Sayed Murtadha Shirazi frequently asks Sheikh Mustafa about me and sends me his greetings. I feel very honored to have met him. It amazes me sometimes because I never would have thought while I was in that prison cell reading and studying about Islam that I would end up visiting the shrines of the ones I grew to love; Ahl ul Bayt (pbut). I also never would have thought that an Ayatollah would be sending me his greetings and taking an interest in me. It is very humbling and I hope to continue down this path of serving the Family of Muhammad (pbut). Recently I heard that Sheikh Mustafa’s father, Sheikh Makki Akhound, was coming from Karbala to visit. 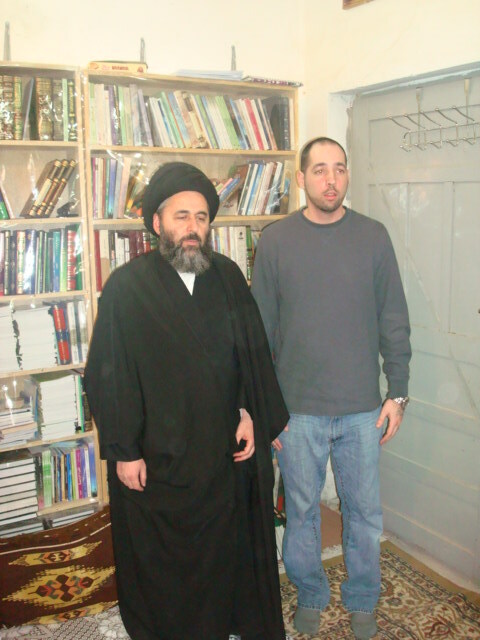 I thought to myself that morning before my Howza class how great it would be if he could bring my books back to Iraq and present them to Ayatollah Sayed Murtadha. So, with this thought in mind I went to my class. Upon arriving at the masjid I saw Sheikh Makki and he asked me how my son and I have been doing. Before I could even say anything about him taking my books to the respected scholar he said “Mateen, Ayatollah Sayed Muratdha Shirazi sends his greetings to you and says he is very proud of the work you have been doing for Ahl ul Bayt (pbut). He wants me to bring your books to him.” I couldn’t believe what I was hearing! 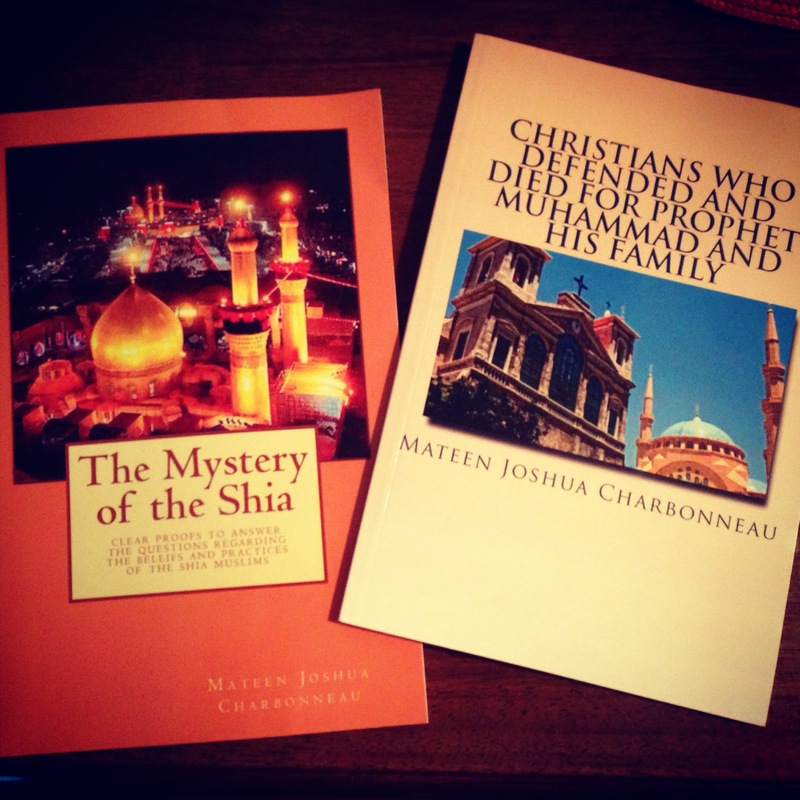 It was a great honor and achievement for me as a convert to Islam that an Ayatollah asked for my books. I sent all three books back to Najaf with Sheikh Makki who presented them to him. 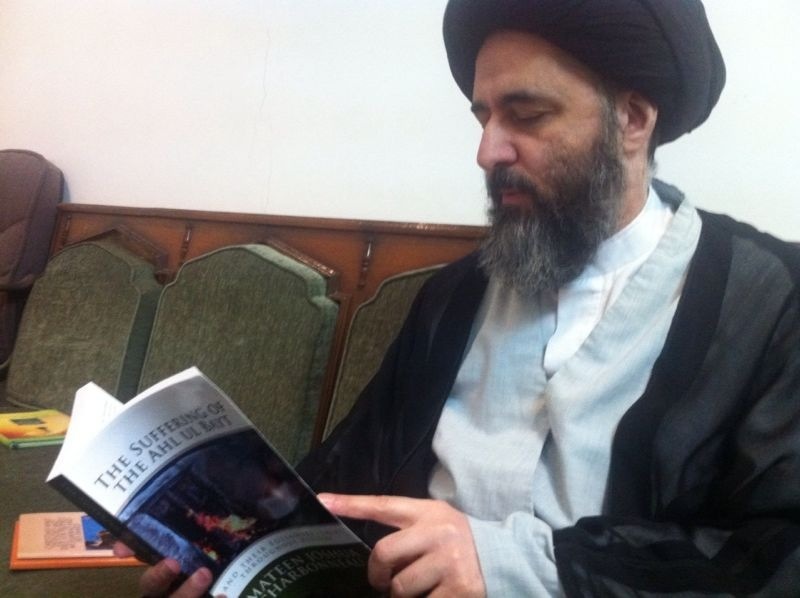 He got a picture of the Ayatollah reading them for me and sent it to my email just this past week. I wanted to share this story with everyone and I hope that we all can take a look at what talents we possess and formulate a plan on how we can use these great blessings to serve the cause of Ahl ul Bayt (pbut) and grow closer to the beloved Imam of our time, Imam Mahdi (May Allah hasten his reappearance).